Screwworms are cutaneous myiases (i.e. 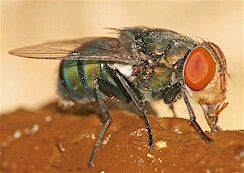 infections with fly maggots) especially harmful for livestock. The affect mainly gazing cattle and sheep, but can attack whatever wild and domestic mammals, including horses and occasionally humans and birds as well. Dogs and cats can be affected, mainly in rural areas. They are found worldwide in tropical and subtropical regions, with a species-specific distribution. Chrysomya bezziana, the Old World screwworm; occurs mainly in tropical Africa and Asia. Chrysomya megacephala. Occurs mainly in Africa and Asia, in the same regions as Chrysomya bezziana, but also in America where it was introduced early in the 20th century. Cochliomyia hominivorax, The New World screwworm. After the large-scale eradication campaigns in North America (down to to Panama) it remains very common in South America. Cochliomyia macellaria. Occurs in America. Chrysomya bezziana and Cochliomyia hominivorax are obligate parasites, i.e. they cannot complete their life cycle on alternative substrates such as carrion, dung or manure, but only on their living hosts. They are also called "primary" myiases, because they are the first flies colonizing the injuries. Although they cannot pierce or otherwise damage the skin of their hosts, they deposit their eggs on minuscule injuries such as those caused by other parasites (e.g. ticks, biting flies) or on any kind of wounds that livestock can get, both occasional (through fencing, vegetation, etc.) or operational ones (e.g. after castration, dehorning, parturition, tail docking, shearing, etc.). Chrysomya megacephala and Cochliomyia macellaria are "secondary" myiases, i.e. they deposit their eggs on injuries already infested with larvae of primary screwworms. They extend and worsen the wounds already infested with maggots. Other species of both genus Cochliomyia and Chrysomya are facultative parasites, i.e. they can survive on carrion and/or other organic substrates. Some species are of forensic interest because they colonize cadavers and enable a quite accurate determination of the time of death. Adults of Cochliomyia hominivorax, the New World screwworm, are medium-sized flies, about 10 mm long. Their body shows metallic greenish-bluish colors, and the eyes are red-orange. The life cycle can be completed in about 3 weeks. Adult females deposit 200 to 400 eggs on injuries of the host, even on minute ones such as insect bites. And they also are capable of laying eggs on uninjured, soft body parts (perineum, body openings, corners of the yes, etc.). Egg laying happens mostly in the afternoon and evening, which prevents exposure of hatching larvae to direct sunlight. Each female lays a total of about 3'000 eggs in her lifetime. Larvae hatch out of the eggs within hours and start feeding on the host's tissues, progressively deepening and extending the injury. If larvae are disturbed while feeding they burrow deeper in the tissues like a screw: this is why they are called "screw"-worms. Besides digestive enzymes larvae release toxins that prevent wound healing. Open injuries become infected with secondary bacteria. Blood and pus attract other flies that worsen the wound. Larvae mature in about 1 week and reach up to 2.5 cm length. Mature maggots drop to the ground, burrow themselves in the soil and pupate within hours. Adult flies hatch already 3 to 5 days later, depending on temperature. By unsuitable weather hatching can be delayed for several weeks. Mating occurs in the vegetation. Females mate only once and keep the sperms in a reservoir for fertilization of the eggs that are progressively produced and deposited. This specific behavior strongly supported the sterile-male release technique used to eradicate these flies in most of North America. By suitable conditions 8 to 10 generations can follow within one season. Adult flies are excellent fliers, capable of traveling up to 250 km in two weeks. Cochliomyia hominivorax prefers habitats with abundant trees and humid environments. It avoids open landscapes and arid regions. Chrysomya bezziana, the Old World screwworm, is 6 t 12 mm long. It has a similar aspect and behavior as Cochliomyia hominivorax. It can complete its lifecycle in 2 weeks. Females deposit 100 to 200 eggs on the border of minute injuries or mucous membranes. In only 2 days larvae have invaded and liquefied the tissues around the wound. If disturbed larvae can burrow themselves into the host's tissues as deep as 15 cm. In less than a week mature maggots drop to the ground and pupate. Adults hatch in 1 to 8 weeks depending on weather conditions. If wounds infested with maggots are left untreated, fly larvae fed into the animals flesh and affected animals can die in less than 2 weeks: they are actually eaten alive. If they survive, they are severely weakened and more susceptible for other diseases and parasites. The hides are strongly damaged and are downgraded at slaughter. Cochliomyia hominivorax was considered the most damaging pest of cattle and sheep in the USA before its eradication (completed in the 1960's). Already in the 1930's damage to the livestock industry in the US was estimated at above $200 million. Thanks to the eradication program it has been eliminated from Mexico, several Caribbean Islands, Guatemala, Honduras, Costa Rica, Nicaragua and down to Panama. Nowadays it remains one of the most damaging pests in South America and parts of Central America. Chrysomya bezziana was and remains a highly damaging pest for cattle, sheep and goats in endemic regions in tropical Asia and Africa. Regional incidence depends strongly on climatic and ecologic conditions. In favorable years regional outbreaks can become a tremendous pests for livestock. The eradication of Cochliomyia hominivorax in the USA, Mexico and most of Central America is the biggest success story of biological control in veterinary medicine. It has been achieved using the sterile male technique developed by R.C. Bushland and E.F. Knipling, two North American entomologists in the 1950's. This technique has been also applied successfully to several crop pests in the USA and elsewhere. It consists in releasing billions of industrially produced male flies previously sterilized through X-radiation. These sterile males compete successfully with natural fertile males and mate with the females, which subsequently produce no offspring. After several years releasing sterile males, natural fly populations are decimated and eventually collapse and disappear from the concerned region. Such a campaign includes an enormous logistic effort for producing and releasing the sterile males at the right places and in the right moment and quantity, and for monitoring the fly populations in vast regions where the campaign is being run. The current eradication campaign aims at eliminating Cochliomyia hominivorax down to the Isthmus of Panama and to establish a permanent biological sterile-male barrier there to prevent its re-introduction from South America. The same sterile-male release approach was used to successfully control an outbreak of Cochliomyia hominivorax accidentally introduced into Libya in the 1990's, which threatened to spread to the whole Old World with potential catastrophic consequences for the livestock industry. There have been no serious attempts to eradicate Chrysomya bezziana, in the Old World using this technique. Strictly speaking the sterile male technique is not a "biological" control method, since biological control is usually restricted to the use of natural enemies of a pest, and sterilized males are obviously not natural enemies of the females of the same species. However, it is an excellent alternative to whatever chemical control methods since it leaves no pesticide residues in food commodities and the environment. Where screwworms are a pest, i.e. in South America, and tropical regions of Africa and Asia, best prevention is to avoid handling practices that cause injuries to livestock during the peaks in the fly season. This includes parturition, castration, dehorning, shearing, tail docking, etc. that attract egg laying flies to the resulting injuries. Preventing infestations with blood sucking parasites (e.g. ticks, horn flies, stable flies, horse and deer flies, etc.) will also reduce the incidence of screwworms, because screwworm flies are also attracted to such minute wounds as those caused by these parasites. Traps have also been used to reduce fly populations, often in combination with the sterile-male technique previously mentioned. For the time being there are no vaccines that will protect animals by making them immune to screwworms. There are no repellents, natural or synthetic that will keep screwworm flies away from animals. Many concentrates used for periodically dipping or spraying livestock or horses against ticks and flies will usually kill established screwworm infestations as well, but only those that contain synthetic pyrethroids (e.g. cypermethrin, deltamethrin, permethrin, etc.) and organophosphates (e.g. chlorpyrifos, chlorfenvinphos, coumaphos, etc. ), not those with amitraz. However, protection against re-infestation will last only for a few days. Pour-ons (backliners) with such parasiticides are often not suitable because they do not ensure complete coverage of the host's body. Otherwise numerous ready-to-use dressings for direct treatment of injuries infested with maggots are available in most countries. They are used preventively for topical treatment of injured body parts after castration, dehorning, shearing, etc., as well as curatively for killing maggots already established in whatever injuries that animals can get. Such dressings are available in various formulations such as powders, lotions, ointments, creams, sprays, aerosols, etc. They contain larvicides belonging to the synthetic pyrethroids (e.g. cypermethrin, deltamethrin, permethrin), carbamates (e.g. carbaryl, propoxur) and organophosphates (e.g. chlorpyrifos, diazinon, trichlorfon, etc.). These dressings often contain disinfectants, painkillers, and/or wound healing chemicals as well. Such dressings for livestock or horses are sometimes approved for use on dogs and cats as well. Systemic macrocyclic lactones (e.g. doramectin, ivermectin, moxidectin) have an excellent efficacy against screwworms. Classic injectables (i.e. containing 1% active ingredient) will cure established myiases and protect livestock for several weeks against re-infestations. They are vastly used as preventatives in livestock after management operations that bear a risk of screwworm infestation (e.g. castration, dehorning, etc.). Pour-on formulations are usually also effective against screwworms. Drench or other oral formulations are usually not effective enough. Insecticide-impregnated ear-tags (for cattle) or collars (for dogs and cats) are not adequate for protecting against screwworm flies. So far there are no effective repellents to keep screwworm flies away from livestock, horses or pets. If available, follow more specific national or regional recommendations or regulations for screwworm control. So far there are no reports on screwworm resistance to parasiticides. This means that if a particular product has not achieved the expected control, it is most likely because the product is not adequate or it was not used correctly, not because screwworms have become resistant.